Peas are one of the most popular vegetables, very nutritious, pleasant to eat and versatile in cookery. Fresh peas from the garden are incomparably better than any peas that can be bought, fresh, dried or frozen in the shops. It is not an exaggeration to state that garden peas have a different flavour, a much sweeter fuller flavour. The remarkable thing is that this flavor is not lost in home-frozen peas, so disregard those television adverts about two hours to freezing, garden peas fresh or frozen are way ahead of the rest. Try it yourself and see! Peas need an open position in full sunshine. They like open soil that has plenty of air between the crumbs. Air is essential for the bacteria that live on the roots of the pea plant to thrive. The bacteria pass nitrogen to the pea plant in return for sugars. The soil should be neutral or slightly limy, a requirement of most vegetables, and lime status should be adjusted with lime if necessary. Peas like soil that does not dry out. The ideal is a silty loam, soft and moist, but not heavy. Well-rotted compost added to light soil improves it and it also helps to open up heavy clay soils. If soil conditions are right, peas are very easy and very successful. There are two main types of peas - ordinary peas and ‘eat-all' mangetout types. 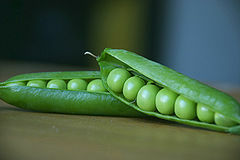 Ordinary peas include petit pois types, while mangetout or pod peas include snap peas, also sometimes called sugar pod peas. Any of these kinds can be grown in the home garden. The ordinary peas are either round-seeded varieties, which are hardier and can be sown very early, even in autumn in some cases, or wrinkle-seeded kinds which are better croppers. A standard early variety is ‘Feltham First', round-seeded, now largely superceded by ‘Fortune' also round-seeded, with excellent flavour. ‘Avola' is another new round-seeded variety of reputed good flavour. Some wrinkle-seeded kinds are earlier than others and a popular variety is ‘Early Onward'. ‘Kelvedon Wonder' is another of these. ‘Onward' and ‘Hurst Greenshaft' are standard varieties to follow the early kinds. Late-cropping ‘Cavalier' and ‘Rondo' are highly regarded as heavy croppers. ‘Ambassador' is a good maincrop variety that has good resistance to mildew and pea wilt diseases. Semi-leafless varieties, with leaves turned to tendrils, are more self-supporting and some are very highly regarded, such as ‘Greensage'. ‘Waverex' is a popular petit pois variety. Most mangetout varieties are quite tall, some capable of reaching over head-height. This makes them awkward to support and to pick. ‘Dwarf Sweet Green' is small in size with typical flat mangetout pods while ‘Oregon Sugar Pod' is a very popular variety, taller with flat pods. ‘Sugar Snap' has round snap pea pods but it is a tall grower. Peas are normally sown directly where they are to grow to maturity, but they can also be sown in pots in a greenhouse early to bring on plants for planting out. Otherwise sow early kinds in March, second sowing in April, third sowing in May and a late sowing using early varieties in June or even into early July. Cultivate the soil well and leave it soft and open. There is generally no need to apply any fertiliser before peas if the ground is fertile and has been fertilised for previous crops and organic material added in previous years. Make a shallow drill about the width of a spade-head and 5cm deep. Scatter pea seeds along the drill or space them evenly about 20 or 30 peas per metre of row in single or double lines. Cover back with soil using a rake to draw it over them. Do not sow in wet ground or poorly cultivated soil, wait a week or two until it dries. Peas tend to rot in cold, wet soil. Watch for signs of the pea seeds emerging and look out for damage by birds, especially pigeons and crows. Snails may have a nibble too, and pea and bean weevils can attack and eat out notches when the plants are still very small. As soon as the pea plants are finger-length, weed the rows carefully, and place the support material in position. This is usually bushy pea twigs of any kind of deciduous shrubs or tree - birch being very suitable - that have been saved from pruning in previous months, or plastic or wire netting supported by posts can be used. The pea plants begin to produce tendrils and climb when they are about pencil length. If a crop of peas suffers a setback due to cold wet weather or dry hot weather, they tend to stop growing, flower and produce fewer pods. Try to ensure there is no interruption to nice steady and rapid growth, by having the soil correctly prepared and by watering during dry spells. Watering around flowering time is especially important to prevent the flowers ‘running off' without setting, and again as the pods begin to swell. Peas can be picked as soon as they are bigger enough. Pick the first pods while the peas are still relatively small - these are delicious. But this early picking also helps to extend flowering and cropping by preventing seed setting. Once a few pods set the plant puts all its energy into swelling these. When picking try to make sure that all the pod that have reached readiness are picked. Then into the fridge straightaway to chill them until they are shelled and eaten or frozen. And this should take place as soon as possible after picking. They only need a flash of steam to cook and can be eaten raw too. Peas are affected by a range of pests, including birds and insects, and some diseases such as powdery mildew and pea wilt. Sowing in wet ground can cause rotting and few, if any, plants come up. Pea wilt and powdery mildew can be problematic on light soil and in a dry summer. Greenflies might appear, though usually not in significant numbers and the normal predators are enough to deal with them. Pigeons can be the worst pest, a single bird grazing an entire row of peas in the hours after dawn.